That’s what they say anyway. The truth is, there’s a lot to get done as you approach the end of the year. And if you are putting together a holiday party, you for sure have a lot on your plate. There’s selecting a venue, deciding the entertainment, choosing the menu, decorating and on and on and on. Although there might be stress in the planning and the preparation. There’s definitely a reward when the company comes together to celebrate the year’s successes together. It also helps when you have craft beer, karaoke, a photo booth and fun games to play. In 2017, there were eleven team members celebrating five years of service with a2b Fulfillment. This talented group of tenured a2b’ers covers various areas of the company including Accounting, Customer Care, Client Services, Picking and Packing, Returns and Refurbishment and Receiving. Several of these team members have worked their way up from entry level positions to become true leaders in each of their departments. We were proud to recognize each of these individuals with a certificate and personalized gift to thank them for their five years of service to the company. In addition to the five-year team members, a2b also recognized Elizabeth Harden, Returns and Refurbishing Supervisor, for her ten years of service. Elizabeth has been an incredible example of hard work and dedication during her tenure with the company. From taking extra shifts to opening and locking up the facility to driving the a2b truck for pickups and deliveries – “Liz” is always willing to do what it takes to get the job done. We were grateful to have an opportunity to recognize her with her own special gift and a personalized plaque honoring her decade of commitment. 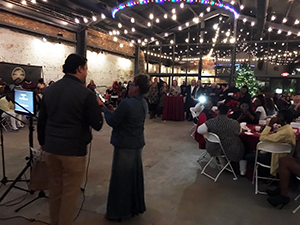 Our party this year was held at the Oconee Brewing Company in Greensboro, Ga. The old North West Street cotton warehouse was near ruin before developers John and Nathan McGarity got their hands on it. The father and son team partnered with brewer, Taylor Lamm and broke ground on the 6,000 square foot facility in June 2016. The project was completed in May of 2017 and we were fortunate to be partying in their event space just a few months after their official open. 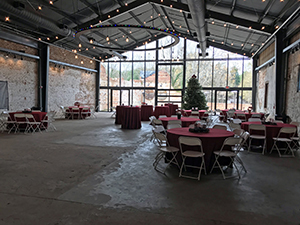 The space has tons of rustic charm and includes a beautiful 18 foot high, floor to ceiling, glass curtain wall that opens to an outdoor patio. The brewery provided cans of their Round Here (Kolsch) Beer and Lion Lamm IPA for guests to enjoy as well. 3. We had a heck of a good time! It wouldn’t be a party if you didn’t party, right? This crowd loves to get down each year and we had a lot to celebrate after a successful 2017. 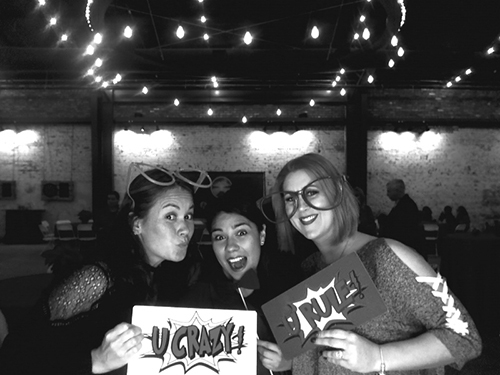 Plenty of time was spent at the photo booth courtesy of Interactive Attractions. There was also terrific music performed by Tre Powell, a DJ-powered dance floor and a delicious southern-style buffet from Save Room for Seconds. 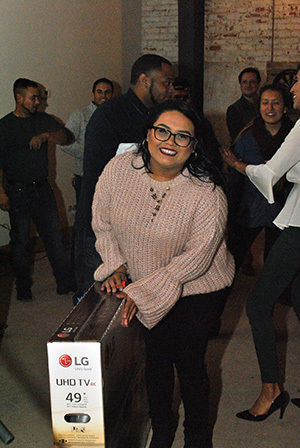 Prizes were raffled off throughout the night and the big winner was Susy Carrasco from the Customer Care Center who took home a 49 inch flat screen tv. All in all it was another great time coming together and honoring this group of a2b’ers. Their hard work is a direct reflection of the success we’ve been able to share in 2017. We want to wish each of our team members and their families a Happy Holiday and a very Happy New Year!